Join us to explore the animal kingdom through music. We hope to see how composers from the classical period through to popular artists use music to embody all creatures great and small. Beginners through to advanced players will explore, rehearse and perform works from the rich chamber music repertoire, take part in orchestral playing, improvisation and singing. In addition to the music making we will get creative with some art exploring the same theme. 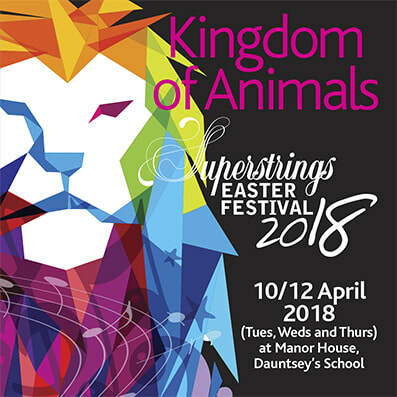 Join Superstrings for a fun three days, jam-packed full of playing, singing and creativity. Have fun with new friends and enjoy making music in the relaxed surroundings of Dauntsey's Manor. See you there! Twice a year we have exciting courses - have a look at past events.